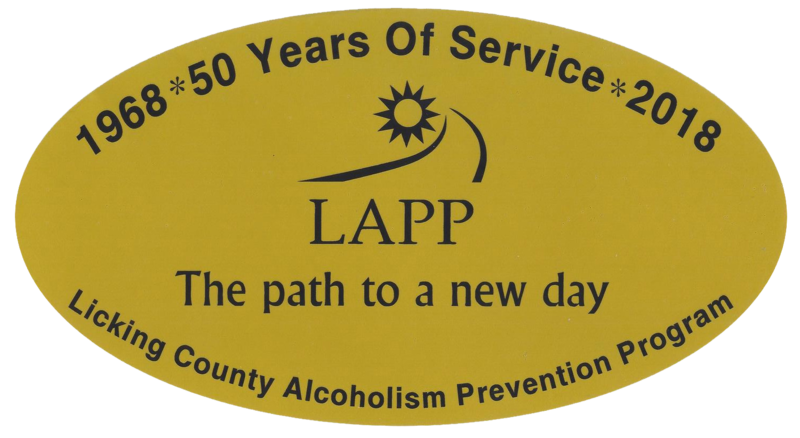 All materials posted on this site are subject to copyrights owned by the Licking County Alcoholism Prevention Program, also known as LAPP. LAPP hereby provides limited permission for the user of this site to reproduce, retransmit, or reprint for such user’s own personal use (and for such personal use only) part or all of any document on this site as long as the copyright notice and permission notice contained in such document or portion thereof is included in such reproduction, retransmission, or reprinting. All other reproduction, retransmission, or reprinting of all or part of any document found on this site is expressly prohibited, unless LAPP has granted its prior written consent to so reproduce, retransmit, or reprint the material. All other rights reserved. The names, trademarks, service marks, logos, and icons of LAPP appearing on this website may not be used in any advertising or publicity, or otherwise to indicate LAPP’s sponsorship, or endorsement of or affiliation with any product or service without LAPP’s prior express written permission. LAPP is providing information and services on the Internet as a benefit and service in furtherance of LAPP’s mission. While LAPP strives to ensure that all information is as accurate as possible, LAPP makes no representations about the accuracy or suitability of any information or services for any purpose. Although this site may include links providing direct access to other Internet sites, LAPP has not participated in their development and does not monitor or exert any editorial control over these sites.